The Interior and Arctic Alaska Aeronautical Foundation was organized to promote the preservation of Alaska's aviation heritage. 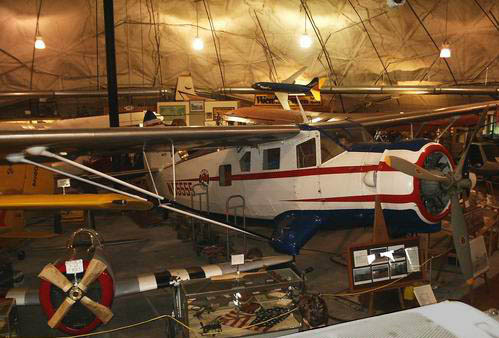 Their main project is the Pioneer Air Museum at Fairbank's Pioneer Park. 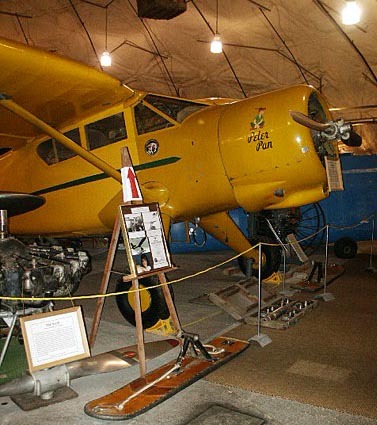 Eleven years later, Carl Ben Eielson restarted The Aviation in Alaska. 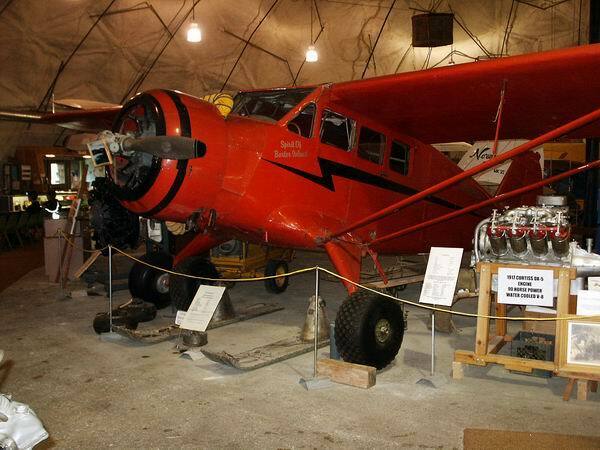 The Curtiss Jenny he brought to Fairbanks still exists, and is on display a the Fairbanks International Airport terminal. Rich in aviation history, Fairbanks has established a permanent home for Alaska's aviation pioneering. It is a 168 foot dome building, the Pioneer Park Pioneer Air Museum, located in the heart of Pioneer Park. The developing organization is the Interior and Arctic Alaska Aeronautical Foundation (IAAAF). This aircraft was flown over most of the Lower 48 Sates during the depressionand WW2. 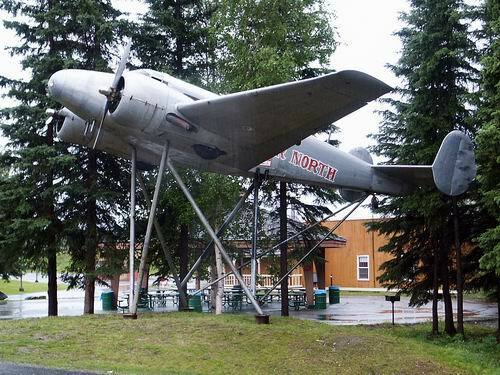 It arrived in Alaska in 1940, in South Central and came to fairbanks in 1953 when it was purchased by Interior Airways. N13482 was in the Arctic for several years while it flew in support of the construction of the "DEW-line" and White Alice projects. With the instrallation of a more powerful Lycoming R-680 engine, it became a workhorse for the Interior and the Arctic. This aircraft has an exceptional history, having been rebuilt several times. This Stinson was built in July 1933 and seats 4 passengers; some specifications: rate of climb 675 ft/min., cruising speed 110 mph and range 450 miles. Another photo of N13482, showing its "Interior Airways"-titles. Interior Airways, Inc. became (1972, I think) Alaska International Air, Inc, which in turn became MarkAir, Inc. The Stinson SR-10 Reliant "Gullwing" was a four-to-five seat commercial monoplane, which was the brainchild of E.A. "Eddie" Stinson, and was designed for private operators and small charter companies. It was the the last model produced by his company before it was bought out in the late 1930s. It was known for its ease in handling and its ability to carry four to five people in comfort. An excellent aircraft, the Reliant could recover from a stall and return to level flight "hands off". These features along with state of the art navigation and communication radios, made it popular with executive charter services as well as with the more sophisticated, wealthy buyer. The Reliant was also used in 1939 to test a unique airmail service for communities that did not have landing fields. Mail was loaded into a container which was then placed on top of a contraption resembling a goal post. As the pilot guided the airplane down, the flight officer held a grappling hook to snag the container. Mail destined for the community was then dropped from the plane onto the airfield. This is the navy version of the civilan SR-10 Reliant of the 1930s. The US Army Air Corps version was called the AT19. Stinson Reliants became the mainstay of Alaskan bush operators for more than a quarter of a century. The large flaps enabled a pilot to land thousand pound loads on unimproved sand bars. Bushplane pilot Clayton flew Reliants on wheels, skis and floats. He flew the mail runs along the Kuskokwim and Yukon Rivers. 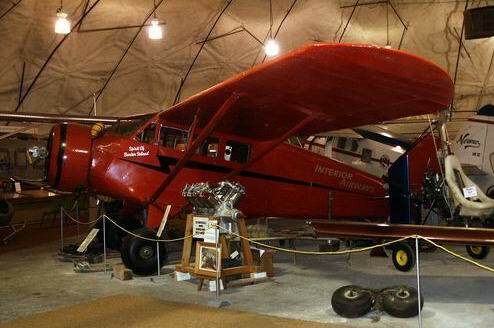 In 1949, with the assitance of his wife, Virginia, he flew this very plane from Bethel,AK to Boston,Mass. "Peter Pan" proved instrumental for Clayton's instrument rating and to become an airline captain. The Claytons returned to Fairbanks and placed "Peter Pan" in storage, where it remained for 43 years. It is displayed here while on loan from the Clayton family. He himself flies the Boeing jets now. The Stinson Aircraft Company was founded in Dayton, Ohio, in 1920 by aviator Edward “Eddie” Stinson—9 years after he learned to fly with the Wright Brothers. In 1925 Stinson would make Detroit, Michigan, the base of operations for his company. Over the next three decades, more than 13,000 aircraft would carry the Stinson brand. From 1933 to 1941, Stinson delivered 1,327 Reliants—ranging from the SR-1 through the SR-10—each variation building upon its predecessor with upgraded engines and design refinements. The Stinson Reliant SR-10, introduced in 1938, was considered the ultimate, featuring leather upholstery, walnut instrument panels, and automobile-style roll-down windows. The Stinson Reliant was a rugged aircraft built of fabric-covered welded steel-tubing structures with a single strut-braced double-tapered wing, and one of the last of the “taildraggers” (an airplane lacking a nose-wheel, so it looked like its tail dragged when taxiing). Noorduyn Norseman UC-64, N5555 (registration is not current). Its 9-cylinder radial, air cooled Pratt & Whitney "Wasp" engine gave it an 800 ft/min climb, a cruising speed of 130 mph and a range of 600 miles. The original company, Noorduyn Aircraft Limited, was formed in early 1933 by Mr. R.B.C. Noorduyn, and a successor company Noorduyn Aviation Ltd, was later established in 1934. 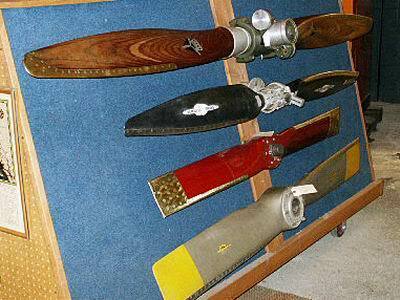 Mr. Noorduyn had been associated with 6 different aircraft manufacturers in Europe and the North American continent. During the later 1930's Norsemen began to appear in the Northwest Territories, Northern Quebec and Ontario, wherever pioneers were breaking open the frontier by air. It soon proved itself to be the air freighter by excellence. The Norseman first made its name doing the job for which it was expressly designed, that helping to open up and supply the Far North. The sturdy Norseman was the first Canadian-designed, Canadian-built aircraft to be sold extensively outside Canada, serving in a score of countries around the world. When WW2 began, the Norseman proved its versatility in military service. During 1942 a modernized version of the Norseman was accepted by the U.S. Army for utility transport purposes, on wheels, skis and floats. When the contract was terminated in 1945, 759 Norsemen had been delivered to the U.S. Forces. 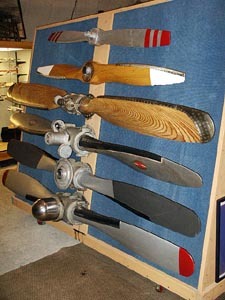 A nice selection of "props" on display in this museum. Outside is a Beech C-45 on display with "Air North"-markings; pity it was pouring with rain, but I guess these planes have seen worse.... Although now unmarked it used to be N701FY, a Beech C-45H Expeditor with construction number AF-620; it was once delivered to the US military as 52-10690. Source: North American Survivors, by Roy Blewitt (2005). "You have a photo of a C-45, Air North, N701FY. I am the one who retired that airplane. Had 3 engine failures with it! Once it sucked a spark plug into a cylinder, sucked a valve into a cylinder once and one time it broke a connecting rod; so Tommy Olsen, principle owner of Air North, decided to retire it. A great airplane. We had 2 C-45's: N701FY and N702FY and I was assigned to 701 (Paul Shanahan was assigned to 702). It was neat having my own airplane to take care of but they were tired airplanes. I went up to Alaska in March 1974 and went to work for Air North. The pipeline was just starting up then. Up until 1976 or '77, about half my flying was connected to the pipeline or exploration work. It was great! The other half was mostly bush stuff in native villages and some charter work. Flew many different types of aircraft: Cessna 180 and 185 on wheels, skies, and floats, Cessna 206's and 207's, Aztec, islander and tri-islander; a little in a DC-3 too. Also piston and turbine Commanders, a Scottish Aviation Pioneer, a little in a T-6 and the C-45s. I flew for Air North till 1978 and changed jobs to work for Alaska International in the Fall of 1978. Flew for them 9 years. I was flying for Alaska International Air when they bought Great Northern. After buying Great Northern, they got the jets in 1984 and changed their name to Markair. While flying for AIA, I did a lot of flying overseas: Europe and Africa and some in the Middle East; and some in Latin America. Turly th egood ol'days! I went to America West in Arizona in 1987, before Markair started flying to the States." Enjoy a flight on a vintage DC-4: Bliss with Brooks !